ANKARA, Turkey (CNS) — Interreligious dialogue dominated Pope Francis’ first day in Turkey, with the pope and Turkish leaders frankly stating their concerns, respectively, about discrimination against Christians in the Middle East and against Muslims in the West. “It is essential that all citizens — Muslim, Jewish and Christian — both in the provision and practice of the law, enjoy the same rights and respect the same duties,” the pope said Nov. 28 in a speech to President Recep Tayyip Erdogan and other officials at the presidential palace. Turkey’s secularist constitution guarantees freedom of religion, but Pope Francis’ call for equality “both in the provision and practice of the law” seemed to allude to persistent de facto discrimination against non-Muslims. Members of the country’s minuscule Christian community — less than 0.2 percent of a total of 76 million — are still commonly regarded as foreigners by the Muslim-majority population, and authorities have kept the country’s only Greek Orthodox seminary closed since 1971. 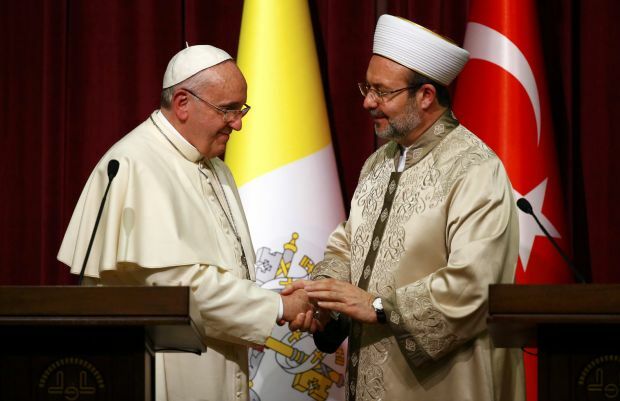 The pope heard similar complaints later in the afternoon during a visit to Turkey’s Presidency of Religious Affairs, called the Diyanet, a large and well-funded government agency that oversees Muslim worship and Muslim education in the country. In September, Gormez complained that Pope Francis had not done enough to combat “violence and discrimination” against Muslims in the West, which he said could not be accomplished “by such things as washing a young girl’s feet or arranging interreligious soccer games,” references to two of the pope’s most prominent gestures toward interreligious harmony. The pope did not speak about discrimination against Muslims to either of the audiences he addressed on his first day in Turkey. Like Erdogan and Gormez, Pope Francis criticized the use of religion to justify violence, particularly in the neighboring countries of Syria and Iraq. Pope Francis focused on the plight of Christian minorities targeted by Islamic State militants there. “Prisoners and entire ethnic populations are experiencing the violation of the most basic humanitarian laws. Grave persecutions have taken place in the past and still continue today to the detriment of minorities, especially — though not only — Christians and Yezidis. Hundreds of thousands of persons have been forced to abandon their homes and countries in order to survive and remain faithful to their religious beliefs,” the pope said. The pope also reaffirmed his qualified support for the use of military force to stop the Islamic State. While he noted that the “problem cannot be resolved solely through a military response,” the pope repeated his stated position that “it is licit, while always respecting international law, to stop an unjust aggressor” such as the Islamic State. The pope did not repeat the qualification, which he had stressed to reporters on two previous occasions, that such military action should be undertaken by a coalition and not any single national government. Though Turkey has condemned terrorism by the Islamic State, the government has proven a somewhat ambivalent member of the U.S.-led coalition against the militants, among other reasons, because of the Turkey’s opposition to the Syrian President Bashar Assad regime, which is fighting the Islamic State. Erdogan harshly denounced Assad in his speech to the pope. The pope was the first official guest at Ankara’s new presidential place, which has 1,000 rooms, occupies more than 1.6 million square feet and cost a reported $615 million. It is a built in a style that has been described as “neo-Seljuk,” recalling the architecture of a dynasty that ruled from the 11th to the 13th centuries. The pope was greeted by a 21-gun salute and an honor guard of dozens of soldiers, many of them on horseback. He approached the palace along a turquoise-colored carpet, stopping to give the soldiers a traditional greeting in Turkish. Earlier in the afternoon, shortly after arriving at Ankara’s international airport, the pope followed protocol for visiting heads of state by visiting the mausoleum of Mustafa Kemal Ataturk, founder of the Republic of Turkey. The pope entered the monumental structure, reminiscent of an ancient Greek temple, and laid a wreath at Ataturk’s cenotaph, a 40-ton block of marble marking the leader’s burial place below.